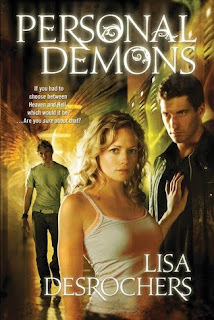 As many of you already know, I'm completely in love with Personal Demons (my review) so when I had the opportunity to do interview and giveaway wish Lisa Desrochers I flipped out! 1. What inspired you to write Personal Demons? I wrote Personal Demons for my daughter, who loved to read. The idea came one day when I was listening to Saving Abel (one of my favorite bands) and reading a bio where they said they got their name from a biblical quote: "there was no saving Abel." That got me thinking about the story of Cain and Abel, and I was mulling over ideas for a book when a name popped into my head. I thought to myself, Lucifer Cain, what a fun name for a demon. That was the beginning of Luc and Personal Demons. 2. Can you give us three words that describe your book? 3. Did you have to do any research about Heaven and Hell to write Personal Demons? My research for Personal Demons focused on angel and demon lore and hierarchies. The beauty of fiction is anything can happen, but I still wanted to ground my fictional heaven and hell in something that at least remotely resembled common belief systems. I decided from the beginning that I wanted to keep Personal Demons contemporary, so I took what I learned and put a modern spin on it. Because Luc’s last name is Cain, I also researched the story of Cain and Abel. I found a piece that talked about the origin of sin. It repeatedly used the phrase “creatures of sin.” That’s the piece that most influenced Luc’s character. It occurred to me that, in my fictional Hell, there could be true Creatures of Sin. Luc was never human. He was borne in Hell of sin—in his case, Pride. He’s a true Creature of Pride. 4. Do you see yourself in any of your characters? Not really. I suppose there are pieces of me in all of them because, let’s face it, they came out of my head, but none of them were fashioned after me. 5. Taylor and Riley were two of my favorite characters. Did you have friends like them while growing up? With Taylor, I really tried to capture the frenemies phenomenon that seems to happen in high school. Riley is the epitome of a best friend—loyal to a fault. Again, neither of them was fashioned after anyone in particular, but they’re more of a montage of people I met along the way. 6. What was your favorite scene to write? 7. Music was mentioned a lot throughout the book. In the acknowledgements section you say Savin' Me by Nickelback inspired Luc and You Found Me inspired Frannie. Is there any particular lyric that reflects these two characters? Also, was there any other music that inspired you to write Personal Demons? As for Frannie and You Found Me, she questions the existence of God and feels like He wasn’t there when she needed Him. This is reflected when the lyrics ask God: “Where were you when everything was fallin’ apart. All my days spent by the telephone, that never rang. I’ll I needed was a call that never came…"
8. I'm absolutely dying to get my hands on Original Sin. Can you give us any hints as to what's up next? 9. Are there any other writing projects you're currently working on? Thanks to the amazing Tor and Forge Books Call Me Crazy is having a Personal Demons by Lisa Desrochers Giveaway! Two lucky followers will be able to get their own copy of Personal Demons. To enter the giveaway fill out the form below or just click here! Awesome interview! I haven't read Personal Demons yet, but have heard lots of rave praise about it. And it's always fun to read authors' playlists and check out what songs inspired their novels. I'm a Saving Abel fan, too. :) Thanks for the giveaway, Katie! Great post. I'm on the fence about this one. Really enjoyed this post, how can I make is so that I receive an email when there is a fresh post?